This was a cool thing I picked up on a whim last winter but never got around to reviewing. It's described as having "holographic silver shimmer flakes" and being scented with White Praline, so it was a no-brainer; I had to have it. 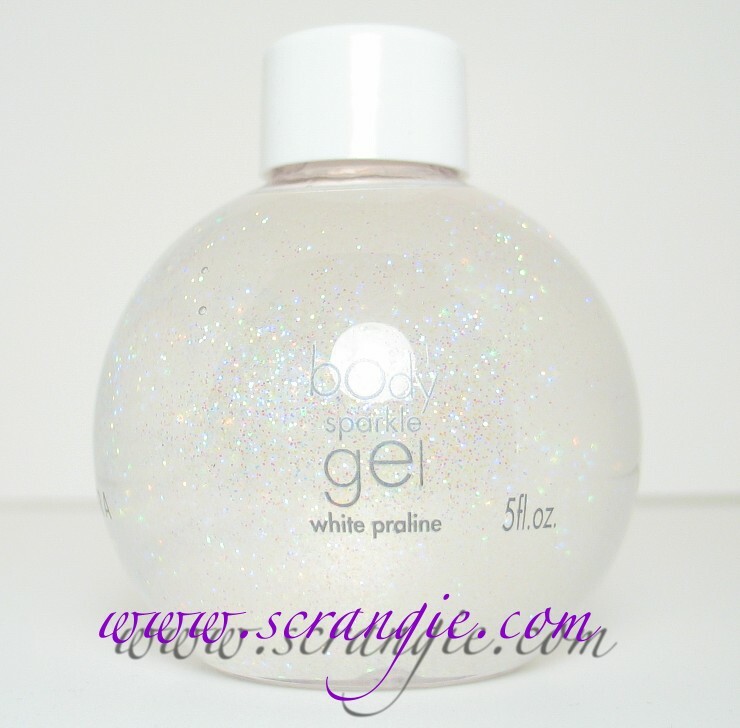 Holographic, gourmand scented body oil? Schwing! Plus, it was dirt cheap and I wanted free shipping. 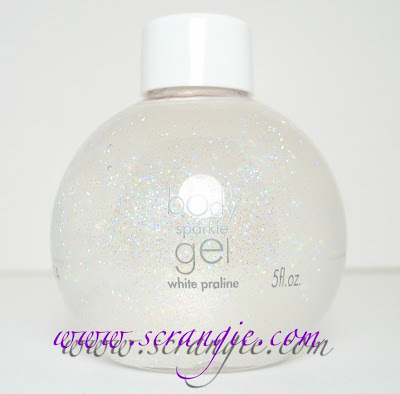 Sephora Collection Body Sparkle Gel in White Praline. This isn't a flat, rounded bottle like the other Sephora bath and body things (you know, the ones that shatter when you try to use them? ), this is actually a 3D globe- about the same shape and size of your average Christmas ornament. Doesn't that look holographic? 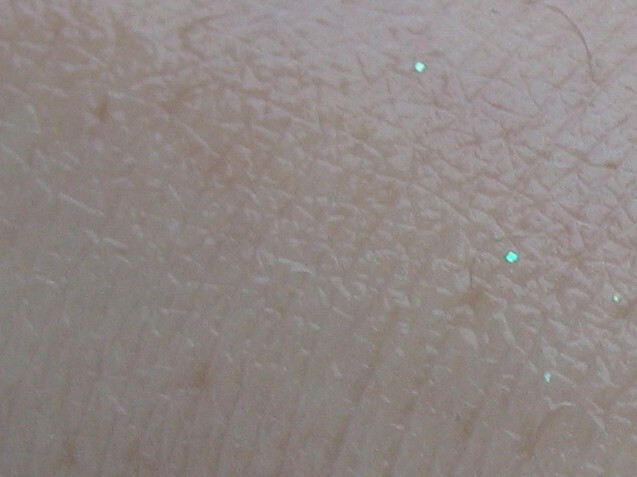 Totally thought I was getting some awesome holo glitter here. ...But this is what it looks like out of the bottle. The glitter is pretty sparse. Right now I could say something dirty about a unicorn, but I won't. Once it's all rubbed in (it's like a body oil, not a traditional body glitter gel), you really don't get much glitter effect. Just a random sparkle here and there. And wow, the back of my hand looks really dry. The scent is nice. It's a dry, caramelly, almost savory nutty scent. It's a little bit hazelnut and a little bit almond. Baked smelling but not particularly sweet. If you've ever used the Avon Nautrals Almond scent, or the Bath And Body Works Nutcracker Sweet, it smells almost identical to that. I loved those, so I love this. Doesn't do much, but it's nice to look at and it smells good, so I'm happy. Only wish it had more glitter. I don't tend to ever wear these products more than play with them ... so now I never even pick them up on a whim. I don't have occasion dressing for this stuff in the super rural area I live in. I tossed all my body glitters and shimmers out a long time ago and pass over them every holiday season as a big 'don't' even look. 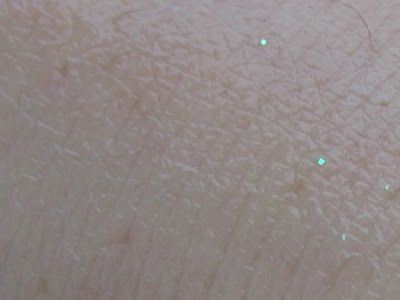 If I want a little sparkle somewhere I can always put a tiny bit of UC eyeshadow on the shoulder or decolletage. Love the unicorn comment! Wish it had more glitter too. Where's the darn holo! Wish it did show up more! While it's not like a body oil or scented nicely, I totally have to recommend the NYX body glitters! The amount of glitter in them is insane and they are so pretty and sparkly! This does look rather disappointing in the glitter department, but it sounds like it smells nice!